The machines available for use are a wide variety of domestic machines, sergers, coverstitch machines, industrial blindhemmer, embroidery machines, two vintage machines and an industrial straight-stitch machine. Members can use any of them on a “first-come, first-served” basis. The studio staff provides free basic instruction for the hardware. 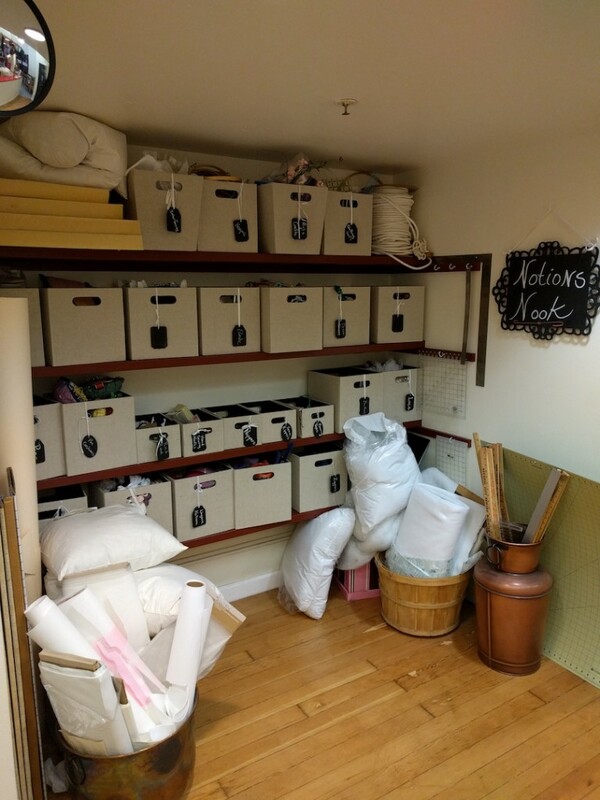 Members can freely use any of the notions provided by the “Notions Nook”, including zippers, buttons, interfacing, thread and so on. Current sewing magazines and sewing books are kept in the Library, and there is also a selection of patterns available. 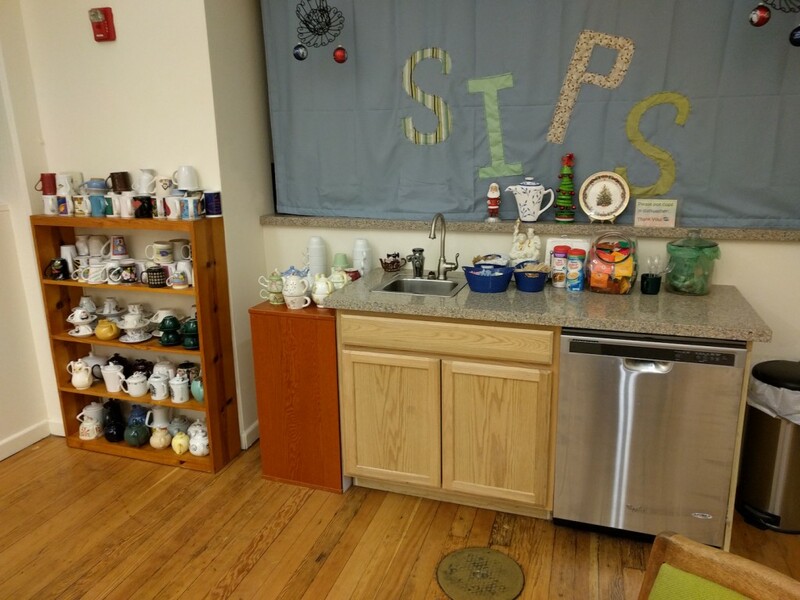 A lounge in the back offers several comfy chairs, a zillion teacups, and a vast selection of teas for members to enjoy. There’s also a classroom space. 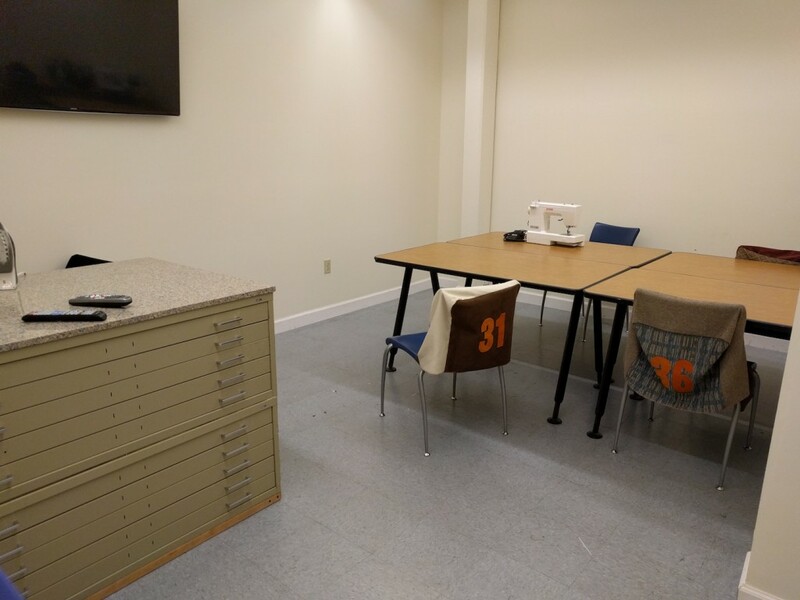 Membership includes access to project-oriented beginner’s sewing classes. And not photographed here is a retail space in the front of the studio. Members can sell items in the retail space via consignment, with both the creator and the studio getting a cut of the proceeds. The owner, Tammy Pfeiffer-Gustin, formerly worked in the local tech industry. 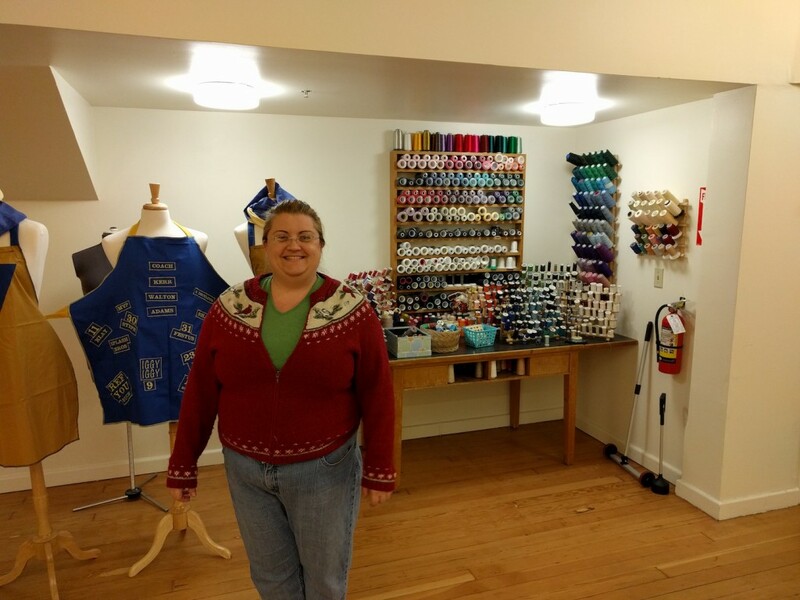 She opened Sips n Sews when she saw a need for a space to cater to sewists in San Francisco. 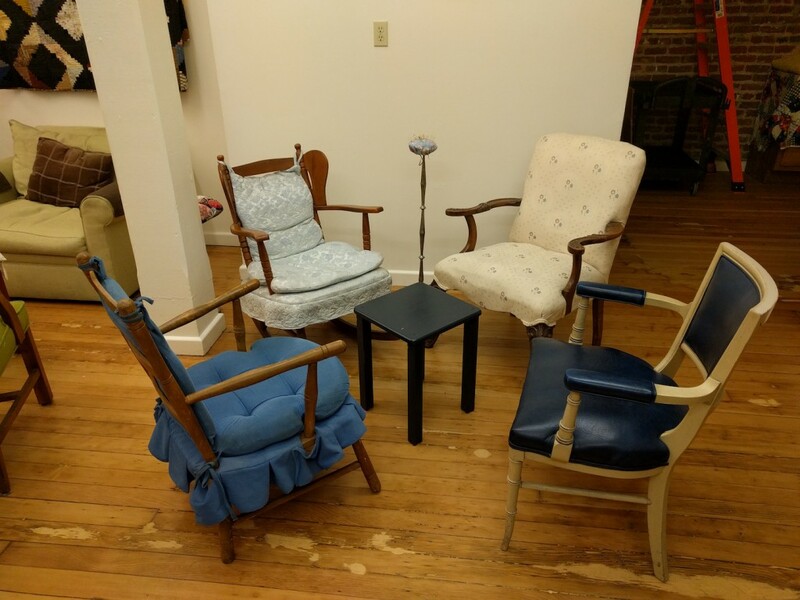 Right now, a lot of the clientele are students in the local fashion schools, but members come from all walks of life and Pfeffer-Gustin wants Sips N Sews to be a hub for a community of sewists in the city. I like the idea of Sips N Sews enough that I’ve signed up for a membership to give it a try. I often feel like a hermit working on projects in my basement and so would like to try sewing in the company of others. The sewing machines at the studio by and large aren’t better than the machines I have at home, but it does give me the opportunity to try out different hardware, such as vintage machines as well as the industrial straight-stitcher. And I also have access to embroidery machines at the studio, which is new to me and could be a lot of fun for a project. 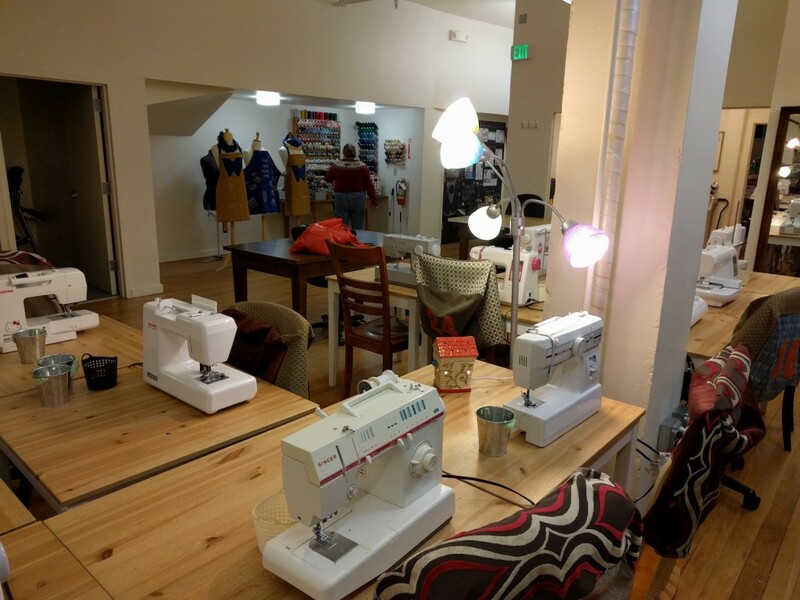 There’s another reason why I signed up for a Sips N Sews membership, which is so I could take a course in patternmaking and draping being offered by Paul Gallo at the studio this January. Paul Gallo is a Craftsy instructor with two courses on draping and bias design. 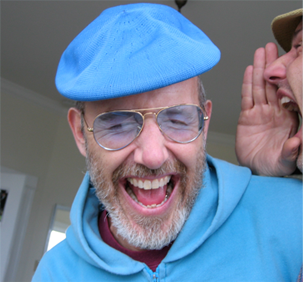 He has a long professional career of fashion design work, patternmaking, draping and teaching. I’m looking forward to taking the course, to get live in-person instruction for a lot of things that I’ve been working though entirely on my own. He invites students to bring in their projects to work on in the class, so I can learn from mine and other’s projects. I’m very excited about it! Coming back from the Bay Area Sewists meeting this weekend, I walked past a clothing store on Mission Street that sadly was going out of business after 65 years. I figured, “Eh, it’s worth a look” and walked in. The owner of the store greeted me with a welcome and a declaration that everything not nailed down was for sale. After figuring out that I could, indeed carry it home on the bus, I paid for it and it was mine. 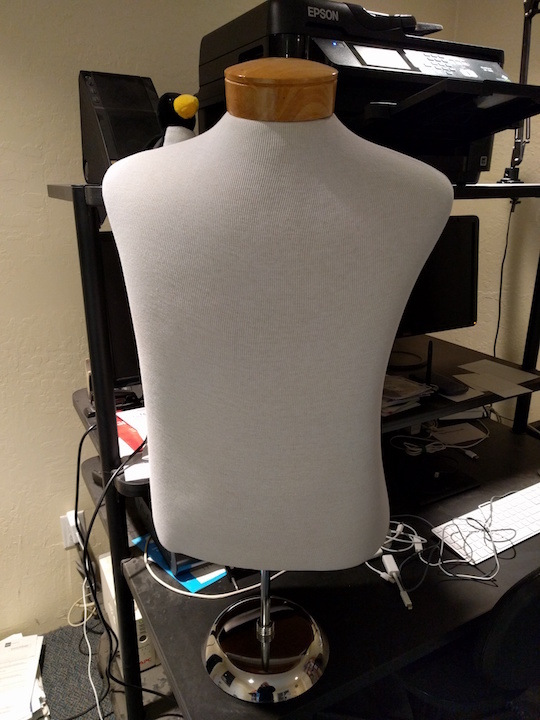 It’s a retail dress form, used to display clothing so it doesn’t have a floor stand. But for $25, who cares? 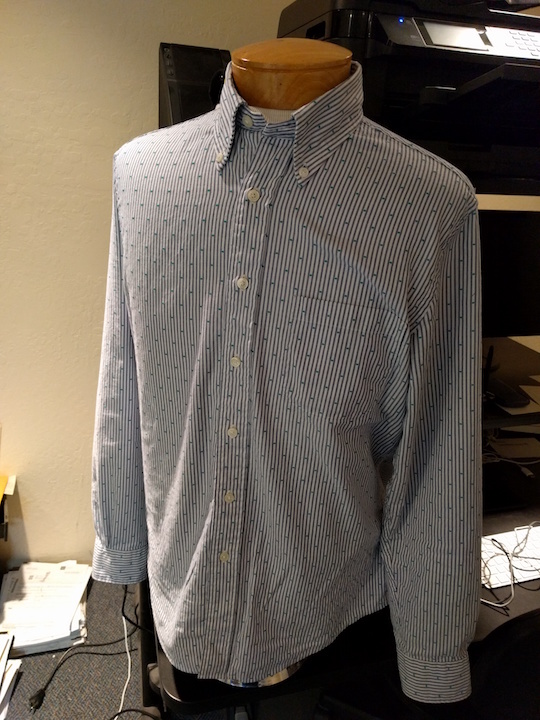 I don’t know yet how useful it will be, but for trying out styling variations alone (various types of collar and shirt-front combinations) it should be worth it. I’ll have a report on shirt fitting. Normally, I find memberships expensive for the time I’ll need on the machines, but I’d love to find a place in NYC where I could try using a coverstitch. I’m not completely sold on the membership thing either, but I want to give it a try. Truth be told, it was the Paul Gallo class which sold me on the membership – it is required for the class registration. For $25, that’s a nice display form. Over the last two years, I’ve spent about $600 buying a used professional form and having it padded to match my shape. Now I need to teach myself to fit. Wish I’d had one from Day One. Hi, I just discovered your blog from a post you made on PR about the duffle class on Craftsy. 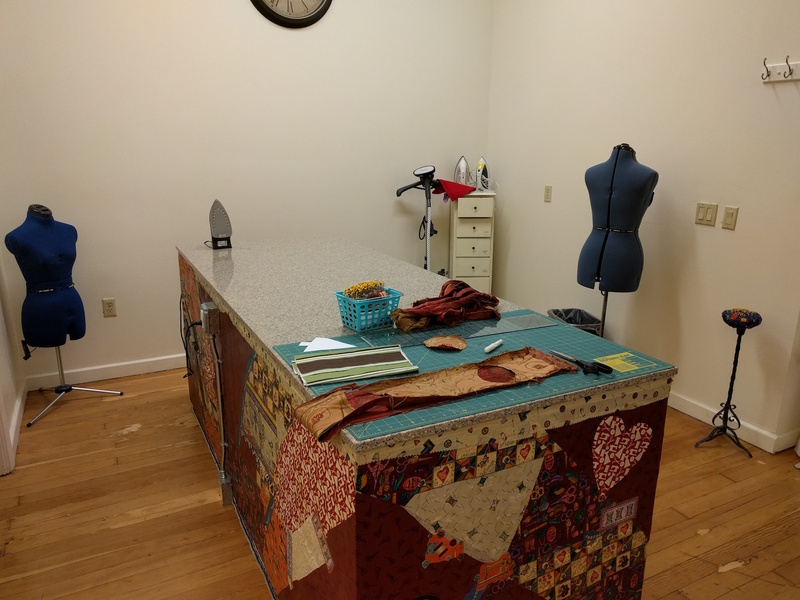 I love the idea of this sewing studio and wish there was something comparable in the sewing deserts of Arizona. No hook on top!! Though I like the idea of hanging the form if that were easy to do. 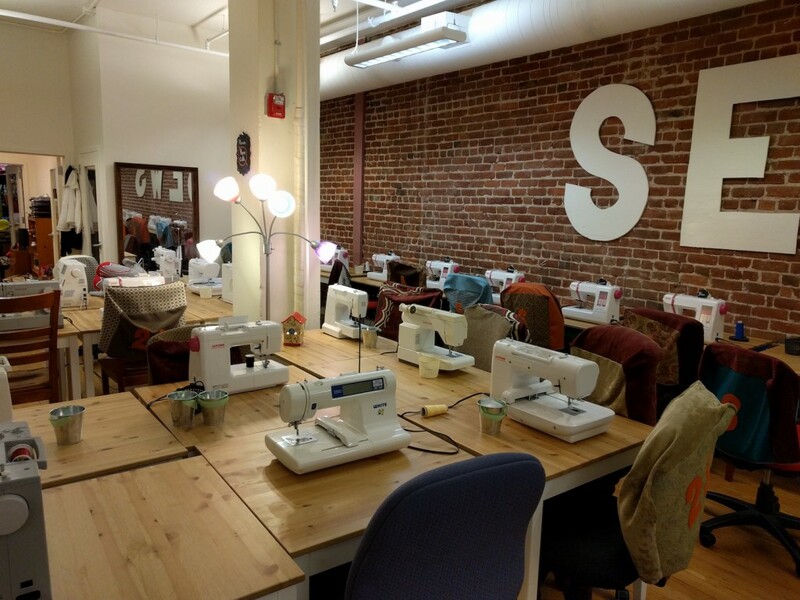 I like the idea of sewing studio, not sure if this will work in Ventura. San Francisco is such a progessive city. No sewing studios here. Hey, you just gave me an idea.